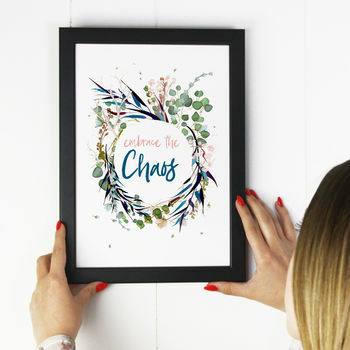 Unqiue and stylish quote print - ideal as an end of term gift for a teacher or a mother's day gift! Available as a mounted or framed print. Archival pigment inks create a stunning colourful print that are fade resistant so the print will last for years - we use archival photographic papers that absorb the inks for a clear and crisp print finish. Opt for the framed version and we will frame it in a contemporary white frame - handmade in Lincolnshire. Text is in a handwritten style font of with a beautiful watercolour effect wreath of floral loveliness. 'Embrace the chaos'. Available in a selection of sizes - A4, A3 and A2. A4 is available as a framed item. Brilliant as a new mum gift or to celebrate a pregnancy or baby shower. Achival photographic papers and fade resistent pigment inks. This product is dispatched to you by Spotty N Stripy.